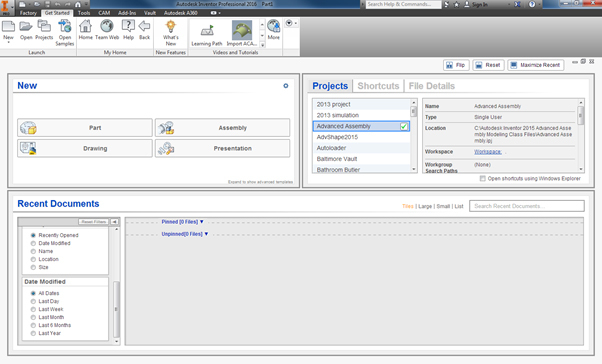 Opening up Inventor 2016 for the first time we get a bit of a shock. It looks very different from 2015. In the top left hand corner you have 2 different ways to access new files. Basic or Advanced. To access the Basic options you click on the Basic column on the left hand side. 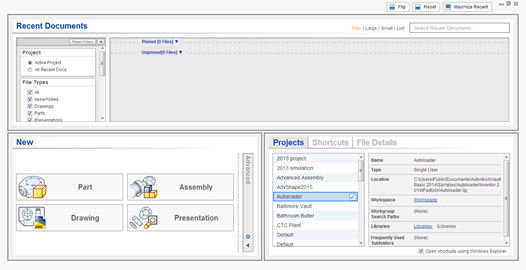 Basic gives you access to create a new Part, Assembly, Drawing and Presentation. To access the advanced options you will click on the column on the right hand side. 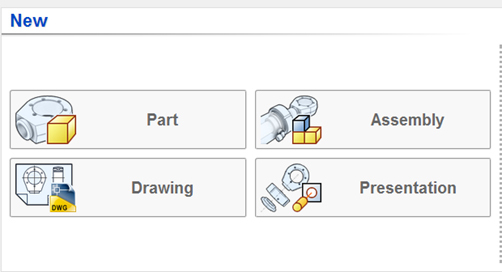 Advanced gives you access to all the templates that you have created within Inventor. 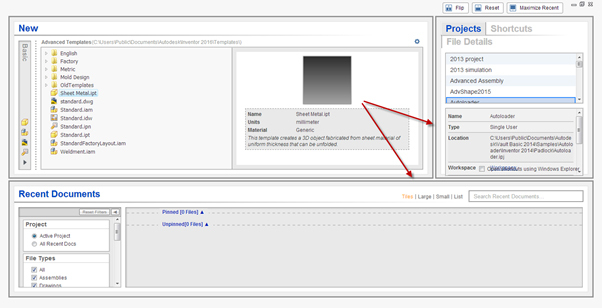 To change the Default Template you click on the Configure Default Templates and setup the measurement units that that you want to work in. This is very similar to how 2015 functioned. Flip puts New and Projects at the bottom of the page. Maximise Recent opens up Recent Documents to cover the full page. 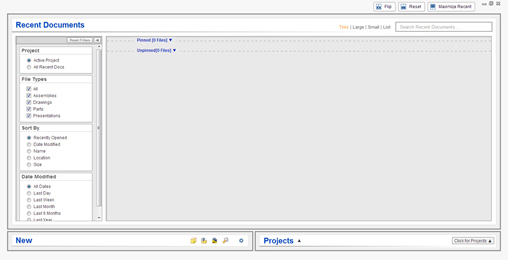 Reset sets the Home page back to New and Projects at the top of the Home page. 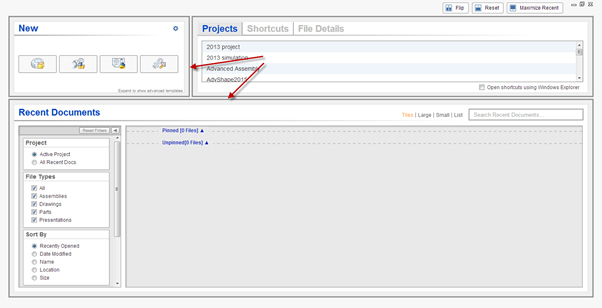 On the right of the Home Page you have information about your projects, Shortcuts and File Details. If you have the Open shortcuts using Windows Explorer box ticked then you will open any shortcuts you click on with Windows Explorer otherwise it is opened within the Inventor Open Dialog Box. If you drag these 2 lines you can also resize the windows. You can pin the file so that it does not get ‘bumped off’ the list. If it is unpinned, then it acts as a ‘revolving’ list of recent documents. When you open up a new drawing or part then the oldest unpinned drawing gets bumped off the list. 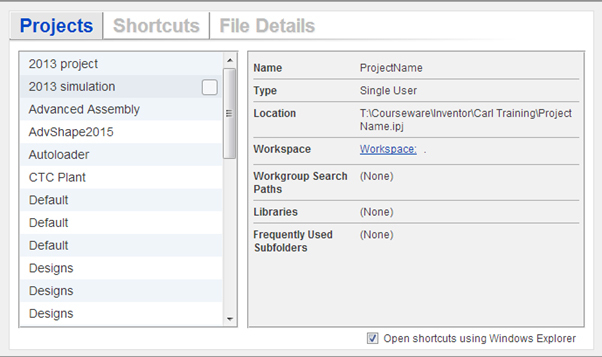 If you hover your cursor just to the left of the file location you will get a few options. The actions you can take is the following. 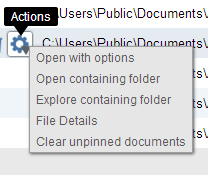 You can also filter your Recent Documents with the following options.